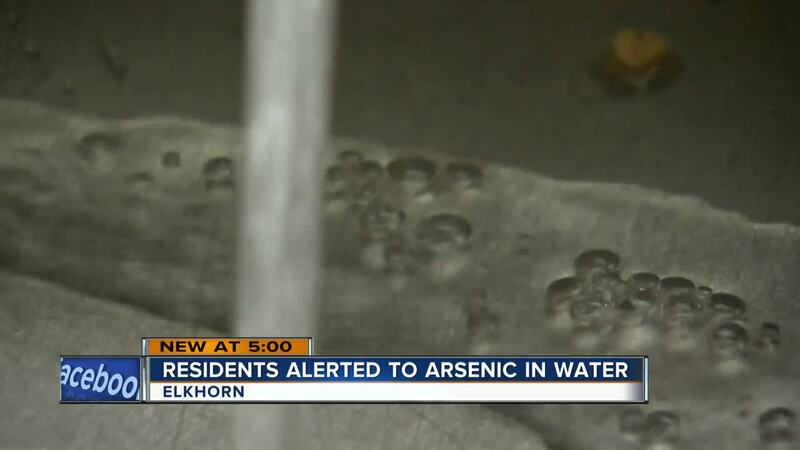 Elkhorn residents received notices about high levels of arsenic in their drinking water. In the letter the city's water utility said there is no immediate risk, but people still feel uneasy. ELKHORN — Elkhorn residents received notices about high levels of arsenic in their drinking water. In the letter, the city's water utility said there is no immediate risk, but people still feel uneasy. Alison Van Horn learned about the notice during her latest visit to see her boyfriend, who lives in Elkhorn. "Coming up here, I drink water. I shower here. It’s kind of concerning," Van Horn said. "I feel like this is something that could be potentially dangerous to a lot of people, especially people with sensitive health issues." The letter from Elkhorn Waterworks, dated Jan. 28, notified residents that water samples from Oct. 26 and 27 showed high levels of arsenic and violated safe drinking water standards. The sample was taken from a water facility on Cobb Road near Highway 11. According to the letter, there is no immediate risk, and if there were, a notification would have been sent immediately. People do not need an alternative water supply or to resort to bottled water. Elkhorn Waterworks wrote it has treatment in place to reduce arsenic, and it will adjust the process to improve how the arsenic is removed. Arsenic is a naturally occurring element, according to the National Institute of Environmental Health Sciences. Researchers have said exposure to arsenic can lead to health problems, disrupt your endocrine system, and it is a known carcinogen. Doug Snyder, the man who helped design the water facility, shared data to show more recent tests reveal the arsenic levels are compliant. Snyder is expected to speak at Monday's common council meeting in Elkhorn.